Successfully Added Zhiyun CRANE V2 Handheld Stabilizer Gimbal - 3 Axis, 360-Degree, For DSLR Cameras, Easy To Use, 26500mAh Battery, App Support to your Shopping Cart. Capture smooth and stabilized footage with any DSLR camera thanks to the Zhiyun CRANE V2 handheld stabilizer gimbal. This cool electronic gadget allows you to easily shoot stable and shock-free video by hand. Whether you’re walking around or sitting on the back of a bike – with this handheld gimbal you’ll always be treated to stunning footage. Thanks to its universal design, you’ll be able to use the gizmo with the vast majority of DSLR cameras and cam recorders with a weight up to 1.75KG. It features an easy design, allowing you to simply attach it to your camera and start using it right away. 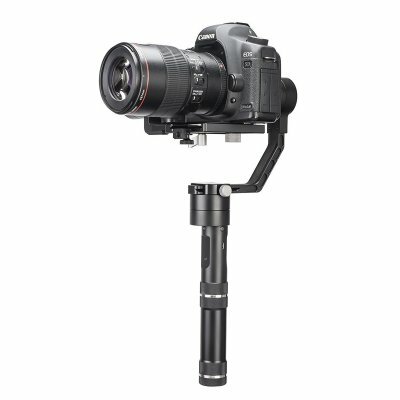 The Zhiyun CRANE V2 handheld stabilizer gimbal for DSLR cameras supports 3 axis rotations through which it allows 360-degree panoramic view. You will be able to spin and turn your camera around at 360-degrees in every any angle. It comes with intergraded 32-bit x3 high-speed MCU parallel control technology for extremely stable and impressive shots. With its App support, you’ll even be able to control your gizmo via your smartphone or tablet for increased usability. A powerful 26500mAh battery brings along up to 12 hours of usage time for you to enjoy. The Zhiyun CRANE V2 handheld stabilizer gimbal comes with a 12 months warranty, brought to you by the leader in electronic devices as well as wholesale electronic gadgets..